The SUV segment is one of the most competitive in the automotive industry. With dozens of models vying for the top spot, it takes a truly stand-out SUV to become the segment’s leader. That’s why it comes as no surprise that the 2015 Jeep Grand Cherokee was named the Top Selling Full-Size SUV by Yahoo! Autos. Currently, the Jeep Grand Cherokee has a total of 174,950 year-to-date sales. 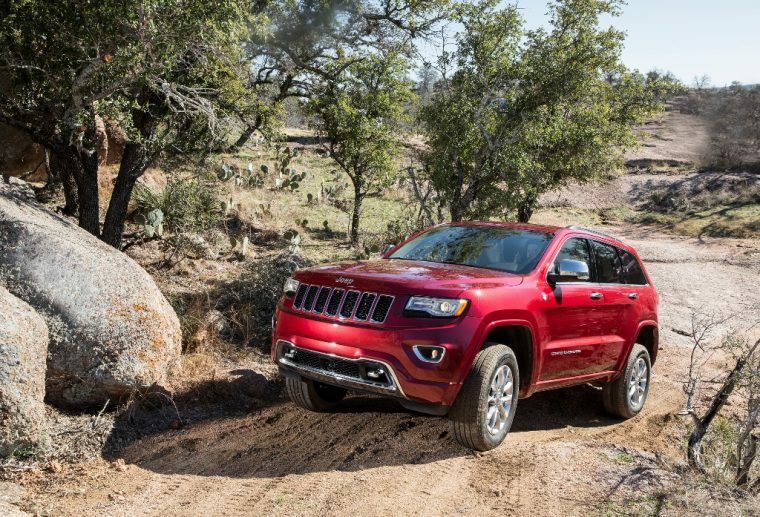 This popular SUV offers consumers the best of both worlds, combining Jeep’s iconic off-road capabilities with the everyday luxury people want. With the exception of the Wrangler, the Grand Cherokee is the most recognizable model in the American carmaker’s lineup. The slotted Jeep grille, angular body lines, and high ride make this large SUV a looker. The Grand Cherokee isn’t just good-looking—it also has the power to boot. In fact, its 3.0-liter V6 EcoDiesel engine was named the Green Car Journal’s Green SUV of the Year. This SUV also has a wide range of gasoline powered engines, including Fiat Chrysler’s popular 3.6-liter Pentastar V6 engine and an incredible 5.7-liter HEMI V8. There are very few boxes the Jeep Grand Cherokee doesn’t check—and a very good reason why this all-American car is one of the favorites in the US. The 2015 Chrysler 200 debuts a beautiful exterior design featuring the new “face” of the Chrysler brand. The 200 is a sleek, Euro styled sedan with an exquisitely crafted interior. New for 2015 is a segment-first nine-speed automatic transmission and an Alfa Romeo-based chassis. With the choice of two world-class engines, an innovative all-wheel-drive system, available sport mode and paddle shifters the all-new Chrysler 200 is a pleasing, fun to drive car. The base engine for the Chrysler 200 is a 2.4-litre Fiat sourced MultiAir 2 Tigershark inline four-cylinder with 184 hp and 173 lb/ft of torque. The bigger engine is the 3.6-litre Pentastar V6 with 295-horsepower and 262 lb-ft of torque. Our tester was a Vivid Blue Pearl painted 200S AWD sedan and had a base price of $31,495 The interior of the 200S is extremely impressive, with a smart, integrated, very polished look. The quality of the plastics, interior trim, buttons, knobs and switches just seem to get better with Chrysler now.The seats are attractive cloth bottomed, leather backed numbers with the ‘S’ logo embroidered on the backrests. They offer good thigh and lumbar support. The drivers- seat is power operated on the S.
The dash is also very cool with stunning blue liquid lighting background for the major instrument and fuel gauge and highly legible readouts. The big control buttons and knobs are ergonomically excellent. The big screen atop the center stack also controls audio, HVAC and the heated seats and steering wheel. It also doubles as the screen for the rear reversing camera. The voice-activated Garmin-based nav system, like everything else is easy to figure out and use. Most impressive is the transmission shift-lever has been replaced by an elegant rotary knob. No clunky, space eating gear shift here! Talking of space, there are tons of little cubbyholes, pockets and compartments for all kind of everyday items. The rear cabin is equally well finished and seat legroom is decent, but headroom is slightly compromised due to the sloping roofline. The trunk is big, well finished and has a low lift over for heavy items. With a chassis based on a European Alfa Romeo, there are some European traits on the road – all good I am happy to report with a firm, yet comfortable ride and exemplary handling. The test vehicle was a line-topping S AWD model with the 3.6-litre Pentastar V6. With 295-horsepower and 262 lb-ft of torque it is one the most powerful engines in this sector. The new nine-speed, ZF transmission is excellent. The extra gear rations help in acceleration and response and help with achieving impressive fuel economy features. The S (Sport) model offers steering wheel-mounted paddle shifters and is activated in. Sport Safety is very high on the 200S. In mid 2014- The US based Insurance Institute for Highway Safety (IIHS) t named the all-new 2015 Chrysler 200 mid-size sedan a 2014 Top Safety Pick +, its highest rating, when equipped with front crash prevention. To sum up the new Chrysler 200 is an extremely impressive sedan in the very competitive family-class segment. With a starting Canadian Manufacturer’s Suggested Retail Price (MSRP) of just $22,495, the all-new 2015 Chrysler 200 is a sedan that customers will be proud to own, at a value they will appreciate. The S model in particular with All Wheel Drive offers a blend of comfort sport and all weather traction in a competitive package. The options in our tester also show how much luxury, technology, convenience and safety can make a big difference to the driving experience. Very impressive and highly recommended.